Just as Rupert Murdoch’s iPad-only The Daily is trying to refresh news journalism for the digital age, USA Today is launching a desperate bid to remain relevant by adding printed data tags to every daily print section. 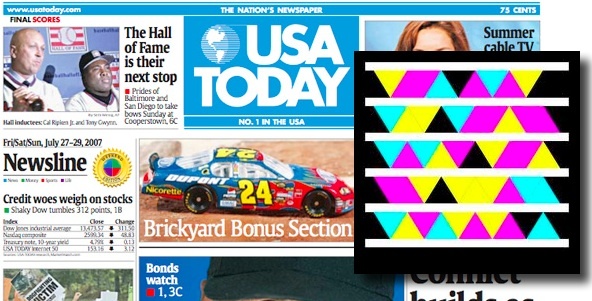 Just as Rupert Murdoch’s iPad-only The Daily is trying to refresh news journalism for the digital age, USA Today is trying a desperate bid to remain relevant–it’s adding printed data tags to every daily print section. Essentially the paper is trying to add bonus content to its dead-tree edition, bolting on the kind of additional data, real-time dynamic, moving images and dynamic advertising that’s been the provenance of web newspapers for some time–a bridge, if you will, between the paper newspaper and USA Today’s web presence. It seems like a good idea. But it’s kind of flawed. To access the additional content, readers will have to have a smartphone or laptop with webcam handy–they’ll point the device’s camera at the Tag, and then get surfed to the bonus link encoded in the Tag itself. But if a user already has a web-enabled smartphone or laptop handy, then they may as well be reading the digital edition of USA Today, and the fuss of fishing out your smartphone or laptop while struggling with three square feet of newsprint will put many users off right from the start. Then they’ll have to download a special app from Microsoft, which, though free, is yet another barrier to consumer interaction. Then there’s the choice of data tag–Microsoft’s Tag protocol. These are essentially colored 2-D “high density barcodes” that contain a machine-readable code compliant with the International Standard Audio Visual Number protocol. When the MS app sees a Tag, it recognizes it, decodes it, and uses the code it finds to direct the device, via MS’s servers, to the linked URL. It’s a system that’s in beta, during which time it’s free to both encode and decode tags…but it’s a proprietary MS system that may change in the future, and relies on MS’s servers for access to the ongoing URLs. Sure, the imminent demise of the system isn’t an issue with such a disposable article as a newspaper, but people will probably see through this as a PR stunt for Microsoft. And they’ll probably find little use for Tags after they’ve accessed USA Today’s codes. 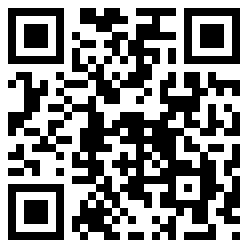 Meanwhile, the much more sophisticated, open-standard (and MS-server-free) QR code protocol–like the black and white example pictured–has already sewn up much of the 2-D barcode market, boosted in part by Google Android’s use of QR to link to apps in the Marketplace. Where this trick may work is as a hook to tech-curious readers, who may be attracted by the novelty of the idea and thus end up accessing USA Today’s web edition where previously they may have surfed to another paper. Advertisers may well like it too. But it does seem like an odd, ill-timed gambit to remain innovative in a week where the iPad and its potential to radically refresh news publishing is stealing the limelight. Update: A PR agency that works with Microsoft Tags (noting it’s not a spokes-voice for the software company) has contacted us to note that Tags are no longer a beta-level project, but have been officially launched. It will also always remain free–a fact that will be welcome to its users. The system does, however, still rely on MS servers rather than acting as a stand-alone data protocol like QR.